In most CRM applications there’s normally some really useful functionality that allows you to record your ongoing interaction with clients. Same goes for many other applications such as Customer Support Systems, and Clinical Records Systems in hospitals that build up data over time. CRM is already good at doing just this for customer facing “front office functions” such as Sales, Marketing and Support but things get a bit more problematic once you get to “back office” ones such Accounts, Buying or Operations etc. Unfortunately life doesn’t always neatly fit into neat “front / back office” boxes. Particularly for smaller companies people may be, clients and suppliers, debtors and have really interesting sales opportunties all at once. You want to record a comment in one place and maybe act upon it somewhere else or share it with someone in a different context. This is where “comment feeds” come into there own. They pull together comments from all over the place and make them visible in any chosen report and thus allow you to search them in any way you choose. So if for example you had a idea / concern in a project the whole conversation can be seen in one place. The screenshot below shows one example of this in action. By filtering on a client name I can see all the ongoing conversations we are having with them. To add a comment field to a table, in the admin interface, just select the type ‘comment feed’ when adding a field in the fields tab. Some people will see Comment Feeds as just another feature, and that is fine. But for me I like to see it as another way in which agileBase can be used to break down silo thinking and help organisations that wish to adopt a more systematic or process orientated view of things. Oh, and it is quite a fun thing to use! In agileBase, you can add a comment to any table of data in the system. Usually this is used for simple collaboration – lots of people want to discuss a particular item, say the design of a marketing brochure being produced, or a sales opportunity. 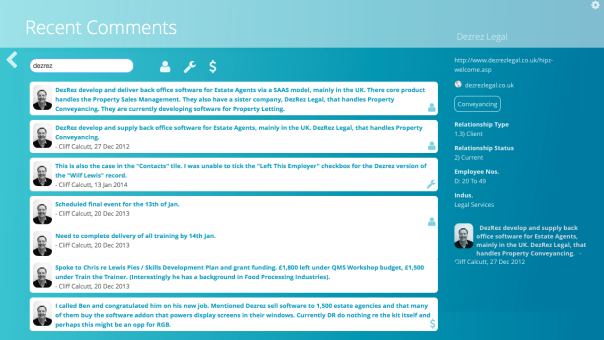 As each person adds their comments, they get recorded in the system as well as being displayed in the global comments stream. Sometimes though, people want to add more information to a comment. For example, the manager of a sales team may like to record whether each comment is from a call out, a call in or an email. This can now easily be set up. As an an administrator, go into the build section, choose a table with a comments field in it and select the ‘field options’ tab. Next to your comment field, click ‘edit options’. Type in a list of options you’d like to appear as a dropdown box under the comment entry space. Separate items with commas.